I go to a sixth form college. My school, PTEM recently had our annual Hari Raya Aidilfitri event. A celebration for the end of Ramadhan and the only time we get to dress up in clothes other than our crisp white uniforms. In short, it’s the closest we will ever get to an actual prom, sans dancing, partying and all that hullabaloo. This annual event makes us dress to the nines, in bright colourful outfits. There were so many beautiful ladies and fine-looking gents around the school. These were those that caught my attention, but certainly not all of them. It's fascinating how much of Brunei's fashion is so ingrained in culture and vice versa. Girls dressed in Baju Kurung and its variations. Take for example, Izzat and Ummi. Izzat looks so beautiful in blue, and floral shawl. Geometric and intricate patterns are usually found in Baju Kurung, which makes each unique but similar in their own way. Ummi's lace red dress was stunning. I loved her pleated skirt and how it trails down, just as much as I loved Ling Ling's monochromatic outfit. I'm a sucker for black and white. With the little designs on her skirt and top, I intend on stealing it. Boys can be stylish too. Bash writes hesitantly. Yes, the identified males dress in traditional Malay attire. 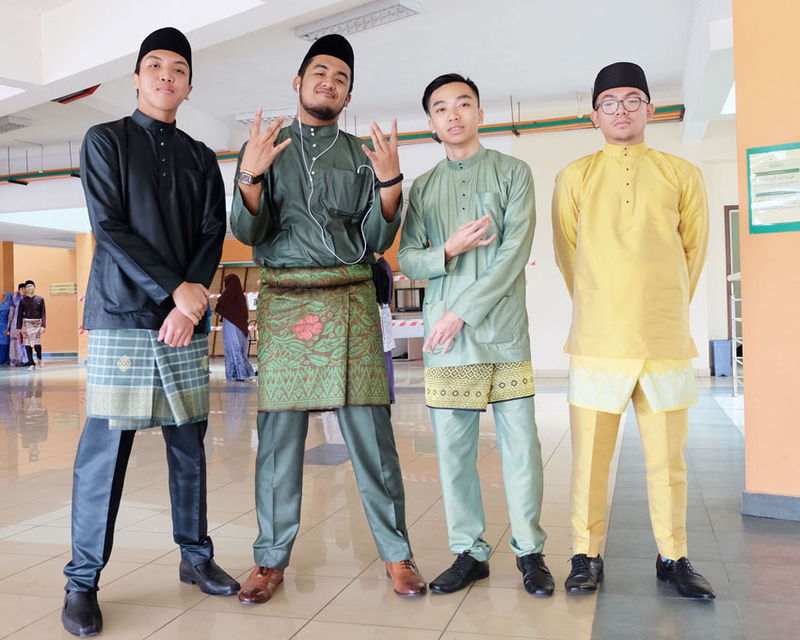 Baju Melayu come in different colours and styles, as presented proudly by Arif, Ibrahim, Malik and Waie. Usually with a Songkok, A sinjang, and loose tunic. With that in mind, Syazwan looked dapper in this popular azure colour. I don't think I can comment any further on men's fashion. I can barely discuss women's. How am I suppose to discuss men's? Capes are popular this year. I expressed my excitement when I wore one on the Three Days of Eid. Here, Amal, Wiah and Izzah showed theirs off. Whether using creams or blacks, I hope capes may transition into daily wear. Seriously, let's just become Batmans. 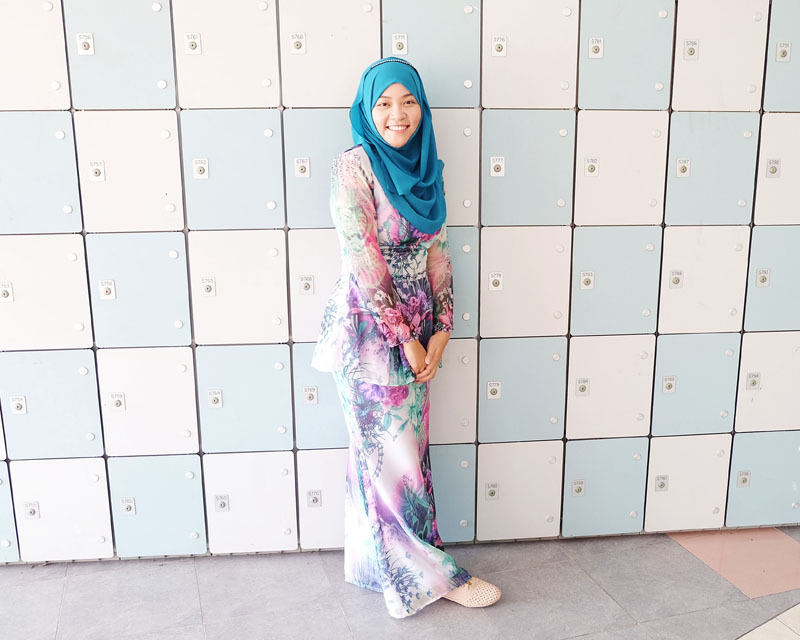 Floral remain a a popular piece, but Sakinah uses it to create a delicate and feminine outfit of the day. The different shades of pink look wonderful on her.Very, very rosy. The Peplum trend from last year still lives on strong. Both Mimie and Sakinah wore variations of the style to the event. 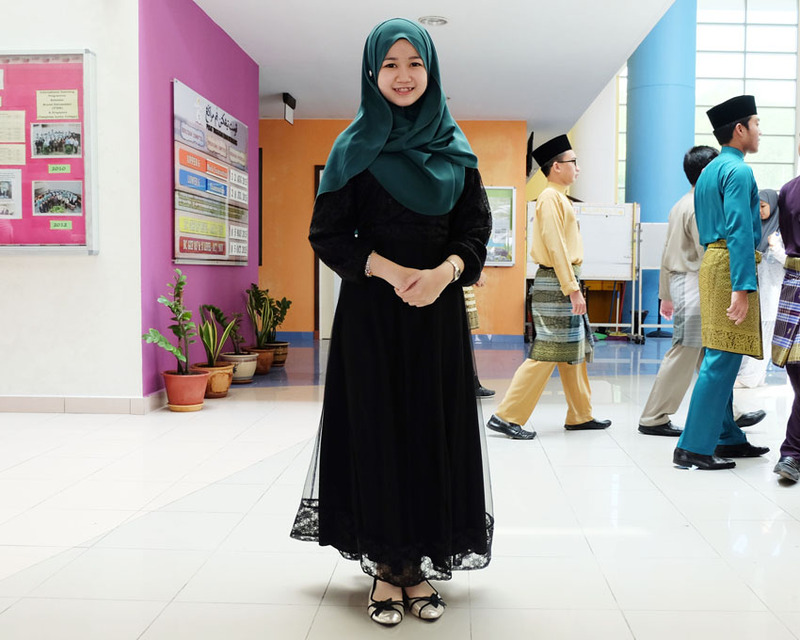 While Mimie wore it with an baby floral design, Sakinah went bold in black with a pop of pink. You can find similar peplum dresses in Zalora here. I contemplated whether I should put this girl in. On one hand, I loved her dress. It's one of my favourites. The subtle lace details over black, with a green shawl. I would wear it, channeling my inner goth kid. On the other hand, I don't know her name. How embarrassing it is to take photos of a girl who's name has escaped me. One of my friends who forced me to feature him was Hafiz. He decided to go with Barbie scheme, pairing his baby blue shirt with a baby pink Sinjang. In the same place, I found Rara and Adi, dressed in sublime red. Red is such a popular colour this year. 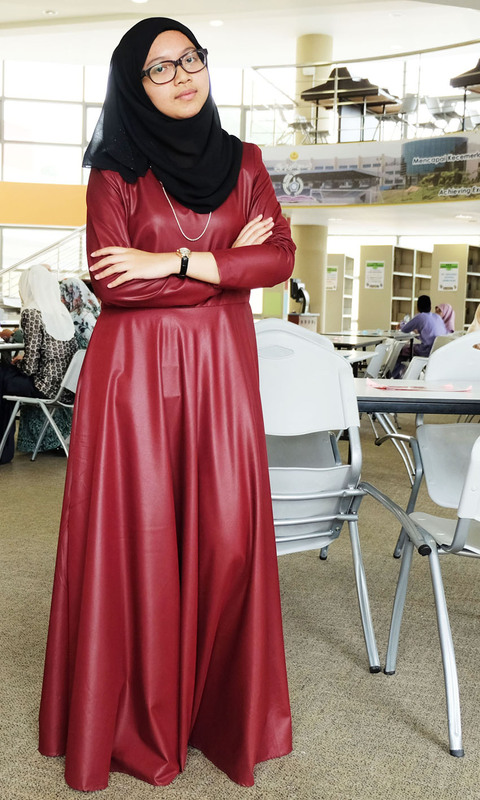 Another dress that caught my eye was Dayah's. I genuinely thought it was leather at first, but it was just the fabric. She designed the piece herself, looking at her favourite designs and compiling the details before sending it to the tailor's. This didn't need fancy lace, or beading. Suffice to say, Dayah looked incredible. 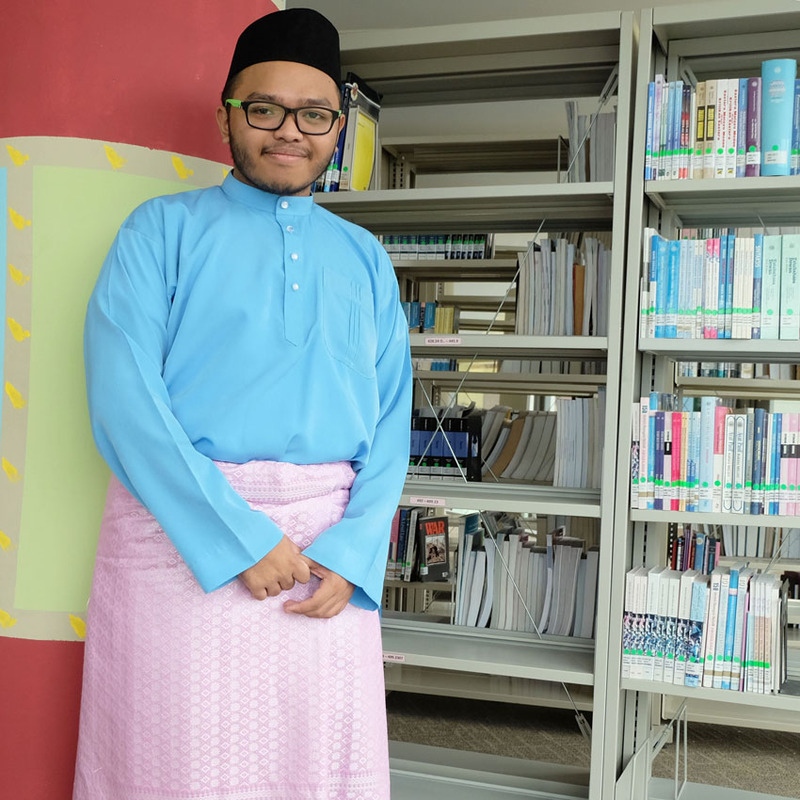 Last and probably the least, here’s what I wore to the Raya celebration. I'm not a bright floral person. I enjoy darker clothes like this dress. For the most part, it’s basic with no beads or unique cuts seen. That is why I loved it so much. From Calvin Thoo’s Ready-To-Wear Lace Collection, the lace pattern catches the eye without the requirement of beads and unique cuts. A beauty in its simplicity. I wore Louis Vuitton wedges at the insistence of my mother (even though heels were banned), then stole Rara's extra lipstick to apply. It was Revlon ColourBurst Matte Balm in Shameless. Which is exactly how I felt, walking around the school in purple lipstick and six inches of illegal heels. The whole event was exhausting. I had fun, but perhaps I would have had more fun if I wasn’t walking everywhere in six inch wedges. With my feet sore, it was the day I accepted that I will get cankles by thirty. I desperately wish I could take more photos and discuss more about the event. Clothes are a part of the culture, but culture makes the clothes. This is where Nadia's blog, Nutmegazine comes in! She did an event piece for the whole celebration which you can find at nutmegazine.wordpress.com here. I hope you enjoyed this post! if you'd like to read more from me and my culture, you should follow me on Bloglovin to be updated. You can follow me on Instagram, where I usually post my Eid photos among other things. So anyway, which outfit is your favourite? The colours! The patterns! Stunning. Everyone is dressed so fancy!! Everyone looks amazing, but no offense - you look the absolute best! That dress is incredible! OMG, Bash! YOU.LOOK,AMAZING! Seriously...breathtaking! Love, love, love everything about your goddess dress! The color and fabric mix: incredible! I love the bold color mix on the others, some of them remind me even of the 70s color scheme. 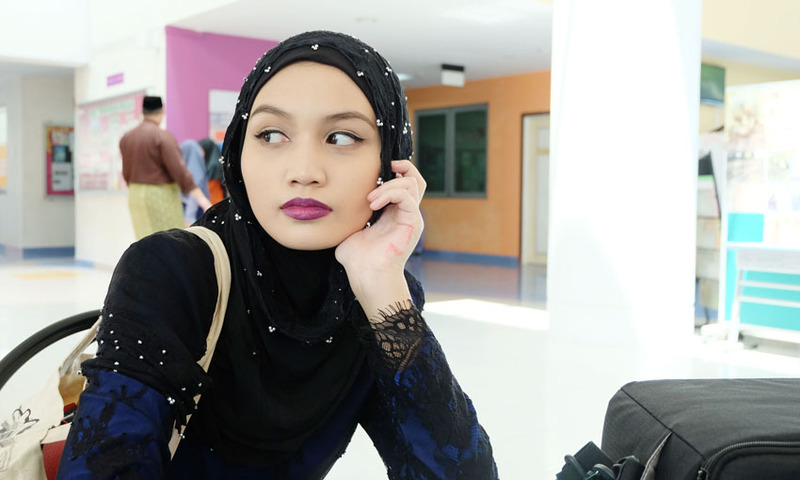 Ling Ling's and Dayah's dresses are my faves and of course that one on that mystical girl! ;) Happy Hump Day, Bash! your outfit has to be my favourite :p the lace is gorgeous! wow- all of the colors and patterns are so beautiful! thanks for sharing these. you look amazing girl! I 100% vote you for best dressed! lol Your dress is stunning! Ugh I have two weddings coming up and I am struggling to find a nice dress for a decent price! Everyone looked gorgeous in all of their outfits and i think it's so nice that it seems like everyone's personality shines through the colors and patterns they choose to wear. Your blue and black outfit looks beautiful on you! I absolutely love all of these looks! Everyone is gorgeous! I loved Dayah's dress! I thought it was leather at first too, but it's so incredible that she designed it herself! I also think it's so cool that you did a little fashion feature around your school, that's a great idea, and there's so much color! I find it funny how guys seem to pose the same way across the world, I've seen hundreds of photos of them doing that pose with feet hip distance, and kind of thrusting forward haha! As always, so stunning! All of you btw, very pretty people! the outfits are so amazing :) very pretty! You guys all look great! Wow, amazing photos! Everyone looks so great, love the lace details on your outfit. How cool to see you and your friends all festively decked out for the holidays. It must be such a fun day at school when you do this :) All the different details and styles really look good! HAHA I love the mystery girl's dress and shawl though. You look stunning! I love your shawl, it almost looks like it's studded. Some of these outfits look really nice, the guys did a good job as well, but I have to say your outfit took the prize, I love it! you look absolutely gorgeous, and that lip color looks great on you. I love learning about different cultures, and omg your clothes look so gorgeous!! You look absolutely stunning in your dress (as always!) Thanks for sharing!